Not many people are aware of how most of the streets and roads in Sarawak got their names. Most of the names were only given many years after the towns and cities were founded. Each name bears a unique story and historical background. Immovable: The big rock formation that gives Jalan Rock its name. Kuching, the capital city dates back to 1841, about the time of Sir James Brooke’s arrival. The other towns were only built after various territories were ceded to Sarawak by Brunei. It also became a custom during Brooke’s time that a fort be built whenever a new town was established. Fort Lili in Betong was established in 1858, Sibu’s Fort Brooke in 1862 and Sri Aman’s Fort Alice in 1864. Bintulu was acquired by the Brooke family in 1861 and soon became an established town despite being a fishing village with a population of not more than 5,000 people at that time. Fort Hose in Marudi was built in 1891 but it was the oil drilling in 1901 that changed the face of Miri forever. Jalan Muda Hashim, Kuching – This road is named after Pengiran Muda Hashim, the uncle of Sultan of Brunei Omar Ali Saifudin II. Pengiran Muda Hashim or Raja Muda Hashim was sent to Sarawak in 1835 to pacify the country. Trouble was brewing as an anti-Brunei force led by Datu Patinggi Ali went up against Pengiran Indera Mahkota, Sarawak’s governor at that time. 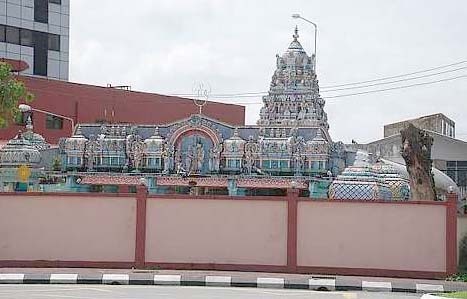 Place of worship: The Sri Srinivasagar Kaliamman Temple which is located along Jalan Ban Hock. Jalan Badruddin, Kuching – Pengiran Badruddin was Raja Muda Hashim’s half brother. Badruddin was said to be a man of his word and full of integrity. James Brooke took a liking to him the instant they met and they became good friends. Brooke had even given Badruddin his signet ring to wear and told Badruddin that should he ever be in danger, to send the ring as a sign of trouble and he will come to Badruddin’s rescue. The two had fought the rebellion together side by side bravely. Soon after Brooke became Rajah, Badruddin was recalled to Brunei. The Sultan was not happy with him being Brooke’s loyal supporter. A plan to murder him and his whole family was made. On the night of April 5, 1846, Badruddin’s house was surrounded and attacked. Luckily, Badruddin managed to get one of his help Japar to send the ring to Brooke but Badruddin and his family all died that night. Japar managed to escape but instead of running away, he fired a keg of gunpowder and blew all of them sky high. Jalan Patinggi Ali, Kuching – Datu Patinggi Ali’s family was responsible for building Kuching’s first mosque. The process started in 1848 and the mosque was completed in 1852. He comes from a direct royal lineage from Minangkabau and Java in Indonesia. He was the leader of the Malays that fought the oppression under Brunei rule. However, he surrendered soon knowing that Brooke would be made Rajah and the Brunei leaders would no longer be in power. 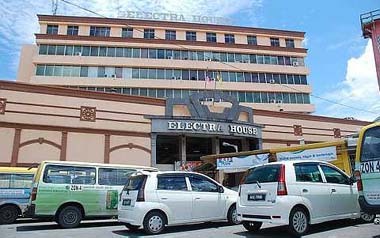 Place to be back then: Kuching’s first shopping mall Electra House which is located along Jalan Power. In 1841, he was eventually reinstated by Brooke as the leader of the Malays in Kuching. The brave Datu Patinggi Ali died alongside George Stewart in a battle at Patusan in 1844. Jalan Ajibah Abol, Kuching – In 1972, the state government made Datuk Ajibah Abol the first woman minister. Prior to that, she was always a prominent figure in Sarawak’s politics, dating back to the anti-Cession days. She won in the first general election in 1970 and remained Parti Pesaka Bumiputera Bersatu’s women leader until her untimely death in 1973. She was also the first woman to receive the Panglima Negara Bintang Sarawak title in Sarawak. Jalan Keppel, Bintulu – Honorable Sir Henry Keppel, C.B.E (Commander of the Most Excellent Order of the British Empire) and Admiral of the Fleet was a close friend of the first and second Rajahs. He was also known as Rajah Laut in Sarawak for his efforts in putting down piracy among the Skrang and Saribas Dayaks between 1840 and 1850 in his ship Dido. The title shows the respect that the locals had for him. He last visited Sarawak in 1900 before he passed away in 1904. There used to be a Fort Keppel in Bintulu, but it was destroyed by bombs during World War II. Jalan Archer, Sibu – John Beville Archer, C.M.G (Companion of the Most Distinguished Order of St Michael and St George), M.S.S (Master of the Most Excellent Order of the Star of Sarawak), was only 19 when he joined the government service. He was made chief secretary in 1939 and retired in 1941 during the Japanese occupation. He was interned at the Batu Lintang Camp to look after the other prisoners during the occupation. Tourist attraction: One of the many historical buildings along Jalan Main Bazaar. On Cession Day, July 1, 1946, he represented the Rajah and handed over Sarawak to the British government officially. The ceremony was held at the Court House, Kuching. He passed away in Kuching in 1948. Jalan Bampfylde, Kuching – Charles Agar Bampfylde served the government from 1875 to 1903 under the second Rajah. He had once saved the Rajah from drowning in the Rajang River when the Rajah’s steamer Ghita was wrecked from a gale. He was made Resident of Sarawak Proper (Kuching District). He held the appointment for seven years before finally retiring. He also co-authored the book A History of Sarawak under its Two White Rajahs. Jalan Crookshank, Kuching – Arthur Chichester Crookshank was Brooke’s cousin. He served the government from 1843 to 1873. His starting salary was only 20 dollars a month. He built the original Fort James at Skrang in 1849 that was later to be dismantled and moved to Simanggang in 1864. It is now known as Fort Alice, named after Ranee Margaret’s second Christian name. He had also taken part in the expedition to punish rebel Dayak chiefs. One of them was against Rentap in 1864. He held the position of chief secretary in 1862 until he finally retired. Jalan Deshon, Kuching – Henry FitzGibbon Deshon served the second Rajah from 1876 to 1904. In 1902, he was in charge of the ill-fated Cholera Expedition where 2,000 out of 12,000 men died from cholera even before facing the enemy. The expedition originally set off to punish an Ulu Ai rebel Bantin. He was appointed as Resident First Division a year before retiring. Jalan Ellis, Kuching – H.D Ellis was the superintendent of Public Works and Survey. He served for ten years from 1897. He was responsible for many improvements around Kuching town including the construction of the river wall. Without the wall, Gambier Street used to slope down to the river like a beach. Jalan Wong Nai Siong, Sibu – Wong Nai Siong, M.A, was the Foochow settlement founder in Sibu. In 1900, he left China and went to Singapore for fear that his life might be in danger for political reasons. Bustling: Rows of shophouses on both sides of Jalan Padungan. He then heard that the Rajah had plans of recruiting labourers. He went to negotiate a deal with the Rajah and brought in the first batch of 72 Foochow settlers to Sibu in 1901. Jalan Ban Hock, Kuching – Ban Hock is a building contractors firm, belonging to Yeo Guan Chow. The naming of the road is in recognition of Yeo’s work for building of government offices and such. 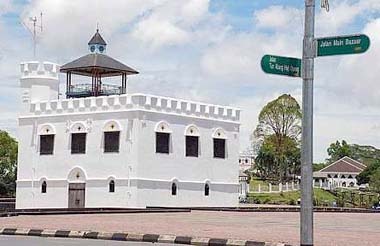 Jalan Barrack, Kuching – In 1911, police barracks were built for Sikh and Sepoy policemen on both sides of India Street and going up to the present Central Police Station. The barracks were dismantled in 1930 as new barracks were built at Jalan Badruddin. Jalan Brighton, Miri – The road located close to the beach where houses are built was compared to the famous seaside town of Brighton in England. 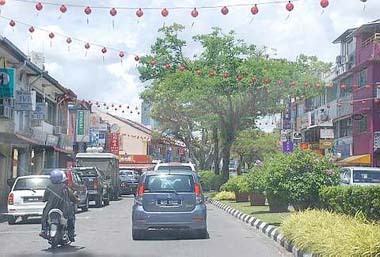 Jalan Gambier, Kuching – The road is named after the famous shrub gambir which was Sarawak’s main export in 1894. The plant’s leaves produce an extract that is used in dyeing and tanning leather. All businesses related to the main export took place along the road, hence the name. 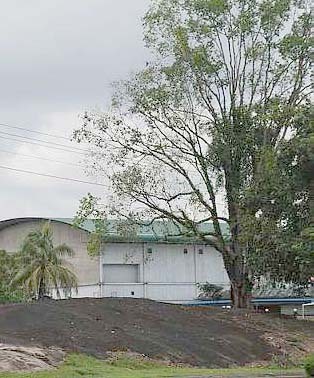 Jalan Green, Kuching – It was a green grass road where the second Rajah used to go horse-riding. It was maintained as a grass road up until after World War II. Jalan India, Kuching – The street had its name changed from Kling Street to India Street in 1928 with the Rajah’s permission. The street is named after the rows of Indian shops that occupy the street. Jalan Main Bazaar, Kuching – Main Bazaar was Kuching’s first bazaar and also the first part of town to have brick shophouses and a five-foot way. Built in 1872, the brick shophouses had survived the Great Fire of Kuching in 1884. Jalan Padungan, Kuching – The road takes its name from the largest Malay village that used to be Kampung Padungan many years ago. The villagers moved away as a road was made to pass through it with shophouses on both sides of the road. Jalan Pending, Kuching – This road actually got its name from the English word ‘pending’. Pending area was the only safe place for ships to take on cargo. The road was named by the Borneo Company that used to keep their cargoes in sheds while waiting for shipment (hence, pending). Jalan Power, Kuching – The street was made and named in 1922 when the electric power station was built. One of Kuching’s earliest shopping malls Electra House, built in 1965, is located here. Jalan Rock, Kuching – The road goes past a huge rock at Mile 2. The rock is known to the Malays as batu kinyang and believed to be sacred for hundreds of years.